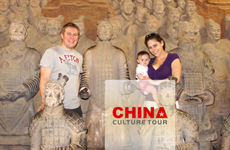 ﻿ China Panda Tours, China Giant Panda Volunteer Packages! Few things are as delightful as observing the wonders of the Giant Panda first hand. Visitors can spend hours watching the playful cubs, or, they can volunteer and provide hands on help to the pandas’ keepers. 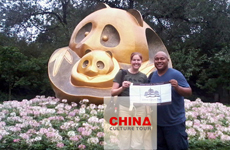 China Culture Tour team offers flexible tours to enjoy the Panda journey. You can be a volunteer for Giant Panda in Bifengxia Panda Base or Dujiang Weir Giant Panda Research Centre for one day or days. Moreover, we offer adventure tours to discover the wild pandas and photograph in the primitive forests. Bifengxia Panda Base(about three hours driving from Chengdu downtown) is searching for Panda Volunteers to help the pandas! Will you be the one? Where to see the pandas in China? There are several places you can see pandas in China: Beijing Zoo, Chongqing Zoo, Guilin Seven Star Park and Chengdu Research Base of Giant Panda Breeding. 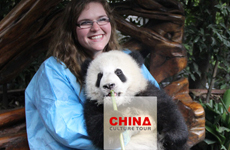 The best place to see pandas is Chengdu Research Base of Giant Panda Breeding. Where to be a panda volunteer? 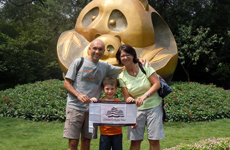 You can choose Bifengxia Panda Base or Dujiang Weir Giant Panda Research Centre. Dujiangyan Base of China Conservation and Research Centre for the Giant Panda (CCRCGP) is a professional organization committed to the rescue and disease control researches of giant pandas nationwide. The base is located in Shiqiao Village, Qingchengshan City of Dujiangyan Prefecture, about 18 km or 1 hour’s drive from Dujiangyan city area. It was built with the help of the Hong Kong SAR Government, taking up an area of 760 mu (hectares) next to Mt Qingcheng, China’s sacred Taoist mountain. The base is built in typical folk house style of West Sichuan, with lush bamboo forests, manicured lawn and winding paths, offering a refreshing environment. The whole base is divided into 6 function areas: rescue and quarantine area, disease control and research area, rehabilitation and training area, public reception and education area, natural vegetation area, and office and logistics area. It is worth mentioning that Dujiangyan Base possesses suitable climate and natural environment for giant pandas – it was designed and built on national green standards, with favorable location next to giant panda world heritage habitat, providing abundant supply of edible bamboo for giant pandas. At present, the first batch of 10 giant pandas rescued from wilderness has come to stay at the base, and hopefully it will have a capacity for the rescue and rehabilitation of 40 giant pandas. Wolong Research Base indicates that Wolong has a captive population of 170 giant pandas distributed in over 20 cities nationwide and across the world. Dujiangyan Base is the first research base in China focusing on the rescue and disease control research for one single species – giant pandas. Ya’an Bifengxia Research Base of China Conservation and Research Center for the Giant Panda (CCRCGP) is located in Bifengxia Scenic Area north of Ya’an City. It is 18 km from Ya’an city area, 150 km (3 hours’ drive) from Chengdu City. With an area of 1074 mu (72 hectares), it now has 22 giant pandas in captivity. Bifengxia Research Base is a big comprehensive giant panda park with functions of feeding, breeding, research, rescue and public education. The base is equipped with over 20 laboratories and venues including giant panda breeding ground, kindergarten, hospital, and research institute, and grows abundant edible bamboos. The free-range area is 10 times larger than the base with mountains, forests, bamboos and water. Over 100 members of staff work for about 70 giant pandas around the base. 1. 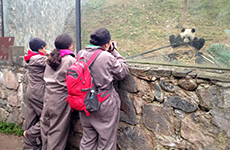 Dujiangyan Base offers carefully designed activities for volunteer panda keepers, such as watching films about giant panda, knowledge popularization, panda feeding, making panda food, and fun quiz. 2. Volunteer panda keepers can take sightseeing cart free of charge to visit around the base (except during noon break 12:00-14:00). 3. Have lunch at staff canteen with 'panda people'. Clean fresh bamboo, clean panda’s feces, learn about giant pandas and how to perform panda behavior research, clean panda’s enclosures, etc. Learn about stories of rescuing giant pandas in wilderness. 08:30-11:30: Morning activities include cleaning panda enclosures, carrying and weighing bamboo, and make panda biscuits under guidance. You will also have plenty of time to watch and photograph the pandas. Remember if you are hurt or injured, neither the Panda Center nor Pandas International is responsible/liable. We suggest you consider travel insurance. In order to volunteer, you should be in generally good health, so we advise you to bring a statement from your Doctor stating that you are in good health. Remember to wear sturdy shoes. Note: Children under the age of 10 are generally not allowed to volunteer.